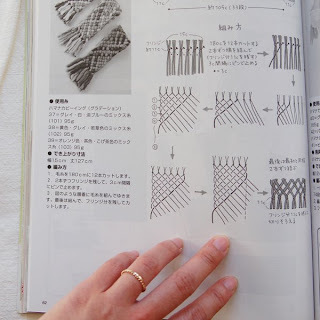 Finally I have time to share this fun way to make scarves. The length of the finished product is 6'4" and the width is 2'-1/4". First, cut the yarns to the desired length. I had 12 of 10' long yarns. 2 of them as a group and tie them together. like the photo shown below. so you will have six group of them. Tie them to the clothes hanger. Follow the instruction here. I quickly did some sketches here. I hope this is helpful. I hung my hanger to my book shelf structure so I can sit on my chair. The Ikea book shelve I have happens to have the steel rod structure so I can easily adjust the height I want. I also tried to hang it to the bath room's towel hanger but then I could not adjust the height. It's a bit painful to stand for a couple hours. Also you need a clean floor space for the excess yarns. remember they are 10' long yarns! I think I was inspired by those back strap loom which attached to wood trunk and human body. 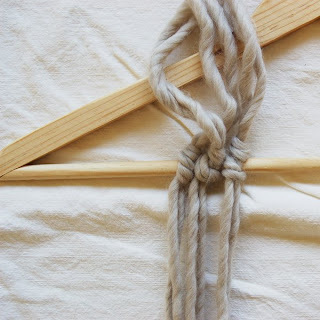 It reminds me that I can simply use my clothes hanger to finish this project. No. 8 is the end condition. You need to always adjust the shape of the scarves. Pull them tight!! but not overly. try to do some swatches before you did a real project. 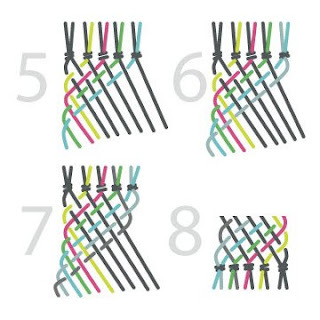 to check the texture, color and get used to the braiding patter. Also you will know what kind of the tension you need. This is the swatch I used the irregular shape yarns so you can see that it got various width. Here is the original illustrations from the book. You will notice that actually the yarns are fixed by the nails. you also can do this way. I tried this at the very beginning . I used foam core and pins but it failed. The pins doesn't hold the yarns well. I just don't have a surface can nail on and also bigger enough for those 10' long yarns. Please feel free to ask me any questions. I may miss some details. I think you will find you own way to do it just like what I did. * It took time to make the scarf, do all the sketches and write this post if you are going to use any of the photos or contents here you need to get the permission from me. You are so generous sharing this beautiful craft! Thank you thank you! And the blue sky alpacas are really irresistable eh. ooh un tres GRAND merci ah-yi! it looks a little tricky..but i will try it! marie, please feel free to link this post! i would love to see your creation! thank you for sharing the pattern...hope to give it a try! your scarf looks beautiful! [and i never seem to keep the knitted/crocheted projects i make either]. Oh, wow! Yu I, this is amazing. I don't think I have the patience to weave, but I so admire the process!! and i'll definately try it..(maybe not for a little while though, its a bit hectic at the moment!).. but i won't forget believe me..
these are beautiful -thank you for sharing your process. Wow, thank you so much for posting this! I cannot wait to try it out. I really appreciate the time and hard work you put into this post to share it with us. yay! 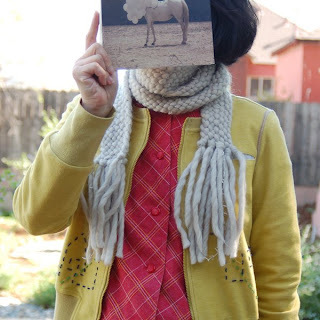 Very lovely scarf! Goes so well with the colors of your clothes. That jacket looks gorgeous too. thanks for sharing that!! I really want to try!! this is such a big, big gift to us!! i want to try it. how many practices to get it lovely as yours. The scarf looks fantastic! Nice combination with the jacket! I like white and yellow together. I love the hangers too :P I have to go searching for hangers this weekend for my little unworn project. this is so lovely thank you so much for sharing! also i think the #2 diagram is supposed to show the green under/over not over/under? ohhh, Jeannie, you are right! i need to correct this right away! Hello! I just found your beautiful blog! I wanted to thank you for this post especially. 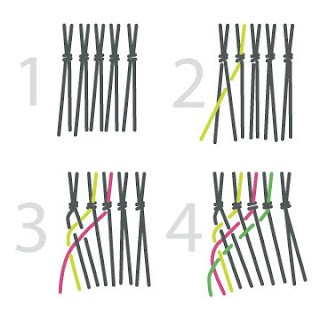 I'm really inspired to make my own braided scarf! Thanks for this post, love it. can't wait to try it. thank you so so very much, I am so excited to make my very own scarf without having to learn how to knit! absolutely wonderful work! i hope to make one soon! i will definitely try this out..thank you! another question: where did you get your ring? it is very beautiful too! 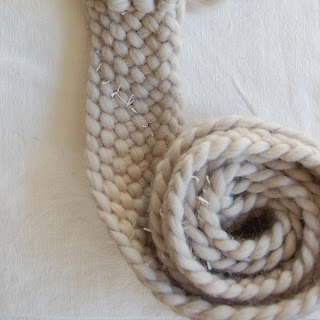 this looks like so much fun with thicker wool! thank you so much for taking the time to share this process with us. I bought one from Reform School when you first posted these lovely creations! It's so nice to see the process, thank you for taking time to share! How clever. This is like some of the friendship bracelets we used to make as kids. Thank you. Wonderful!! I've done scarves like this based on those embroidery friendship-bracelets, but I never thought of doing them all one color, or with such thick, rich yarn. It looks beautiful!! Your tutorial is fantastic, too. You've inspired me to pick this up again!! I have tubs and tubs full of yarn to use and I may have found something to do with it finally!! 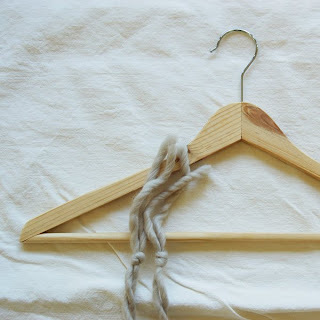 Any tips on what to use if you don't have that style hanger? I may just go buy one because it looks easy that way lol. This is such a beautiful technique! I cannot wait to try it. may i post a photo of this on my blog? i will link and give you 10000% credit. This is beautiful - I was so inspired, I made my own. I can't wait to try it with the blue sky alpaca. You can see my pictures at my site (and I put in a link saying I saw it here first.) Thank you! this is great, thank you!! i will definitely have to pick up some thick, chunky yarn and now i have a reason to look forward to the cold weather in the fall! I am definately giving this a try! It looks beautiful! Thanks for taking the time to share your instructions! Hi, thank you for posting this. A few years back at my weaving guild I began a project with this technique, a bag formed in the round around a full paper towel roll. It was a bit more complex because of its round nature, and I never did finish it. However, now I am inspired to make a narrow scarf, perfect the technique, and go back to my abandoned project. Thanks again! I love this! 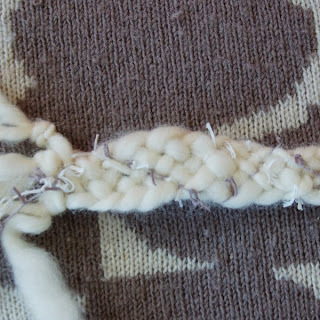 I even made a cute little scarf for my poppet with this technique, thankyou ! lovely, will try it for my autumn's project, thanks...ps love your blog and have a great day..